With stocks itching for a new excuse to levitate higher, they got that overnight when a Reuters report on fresh "progress" in the U.S.-China trade talks and renewed "optimism" in a trade deal helped propel world stock markets to a 6-month high on steered investors away from safe havens such as the Japanese yen, even as 10Y Treasury yields dipped modestly, as the same catalyst that has driven stocks higher on virtually every single day in the past quarter has continued to do so again and again, right out of the cult groundhog movie. Bunds, US Treasury, and Gilts were confined to very tight ranges, as BTPs trade in a choppier range with peripheral yield spreads widening to core at the margin. 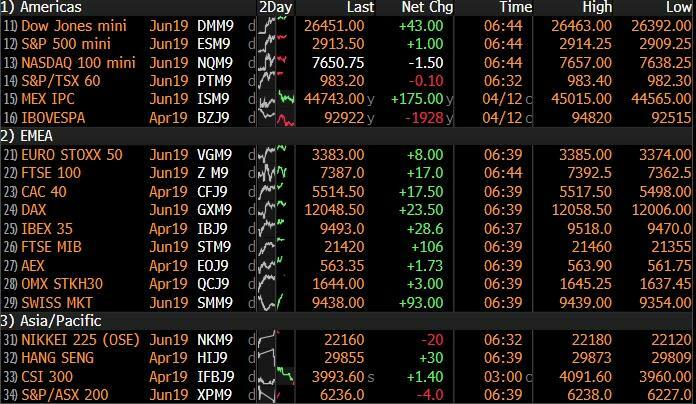 G-10 currencies drift sideways in quiet trade, SEK marginally outperforms peers, CAD and NOK lag on commodities weakness. Expected data include the Empire State Manufacturing Survey. Schwab, Citigroup and Goldman Sachs are reporting earnings.